Humans can only pick up a certain range of both visible and audible frequencies, i.e. from-to. It is, however, well known that infra- and ultra- worlds exist, that scales extend to both sides. Equally, there are also transition and contact zones, where the inaudible holds onto the audible, the audible rests in the inaudible, the visible challenges the invisible: just as by closing one’s eyes one can see a negative afterimage of what was seen, which then dissolves into darkness by light transformations. These boundaries are Marcel Bačić’s true places of residence. Except that his contact zones also include much more complex intersections: of the audible with the visible, the audible with the invisible, the inaudible with the visible, the inaudible with the invisible. Likewise, for the mannerism of an erudite and polymath to be in full shape, exemplary memory and supervised oblivion are activated simultaneously. 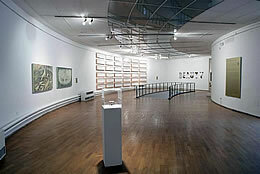 By choosing dialogical partners, elective relationships, from history that has been translated into synchrony – Villard de Honnecourt, Klee, Max Ernst, Hans Arp…intellectual explorers like himself – Marcel Bačić exhibits and disguises his incentives, reaching for the whole or liberating details, developing them from the initial phase in unpredictable metamorphoses, in waves and motions. A comparison of the nature of this motion can only be an unfolding of breath and smoke. The basis of Bačić’s visual music is music paper, present in its noble materiality and its appropriateness to the frottage technique (creation by erasing, construction by reconstruction): “And on things mobile, on things passed, you want to scratch…“…Music paper affirms the horizontal as the code of course, flow, change, cardiogram rhythm. It is an imprint, a graphic, to which one adds by painting and drawing – conceptually: by imprinting – Bačić’s life (in culture), his biography. Many of Bačić’s visual stimuli come from the sphere of cryptic scripts, such as paper marbling, old binding imprints, moiré textile, airy knitwear. These quotes from a labyrinth are a kind of slow art, where important shifts happen in millimetres, and (in)finite impressions change according to the angle of light. A look is not enough to experience Bačić’s “sheet music“. Iconographic and other forms of ignorance always make for an inadequate relationship towards painting. Identifications and comparisons, through some bright doors, uncover ever-new layers, the painting gains its depth, and motions of the surface, left and right, sink into the time funnel. But even when nothing is known about the deposit in the painting, it also has to speak to an innocent eye. It speaks to it in doubled pages, muffled colours, contrast of a persistent, linear horizontality and swaying of membranes that elude it, in abundance of details that are often barely noticeable, and which turn a quiet surface into a surprising text. 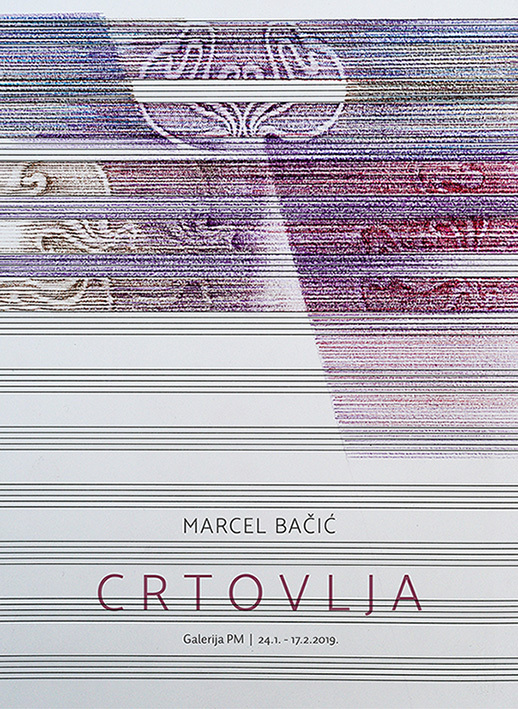 The artist’s self-irony – which he doses as un soupçon, is a complement, not to say a corrective, to the lyrical nature of Bačić’s “sheet music“. Finally, quotation marks should be removed from “sheet music“. A gramophone needle produces sound by tracing record grooves, obviously time also becomes audible by tracing the lines on our fingertips. It is certain that everything visible can be played, and everything the ear hears can be translated into painting. Besides being a musician and painter, Marcel Bačić is also a translator. Closed on Mondays, Tuesdays and holidays. Working hours during the Long Night of Museums, on February 1, will be from 11 am till 1 am. 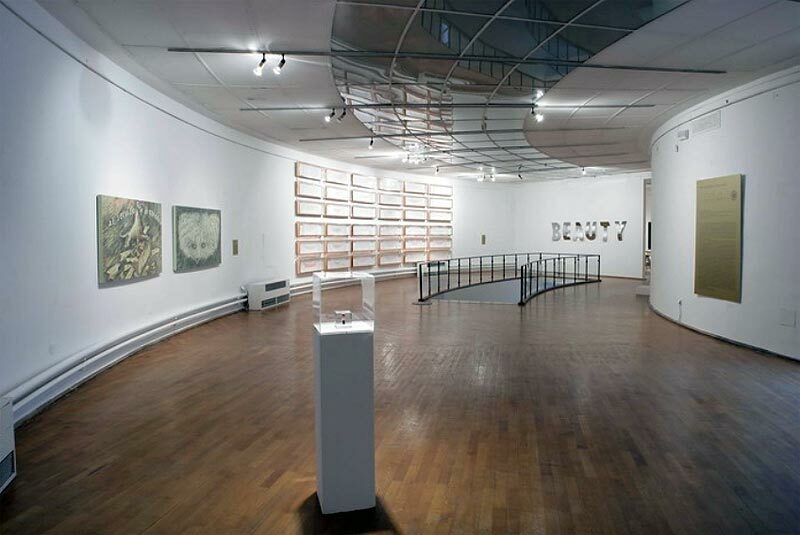 At 6 pm there will be a guided tour through the exhibition.